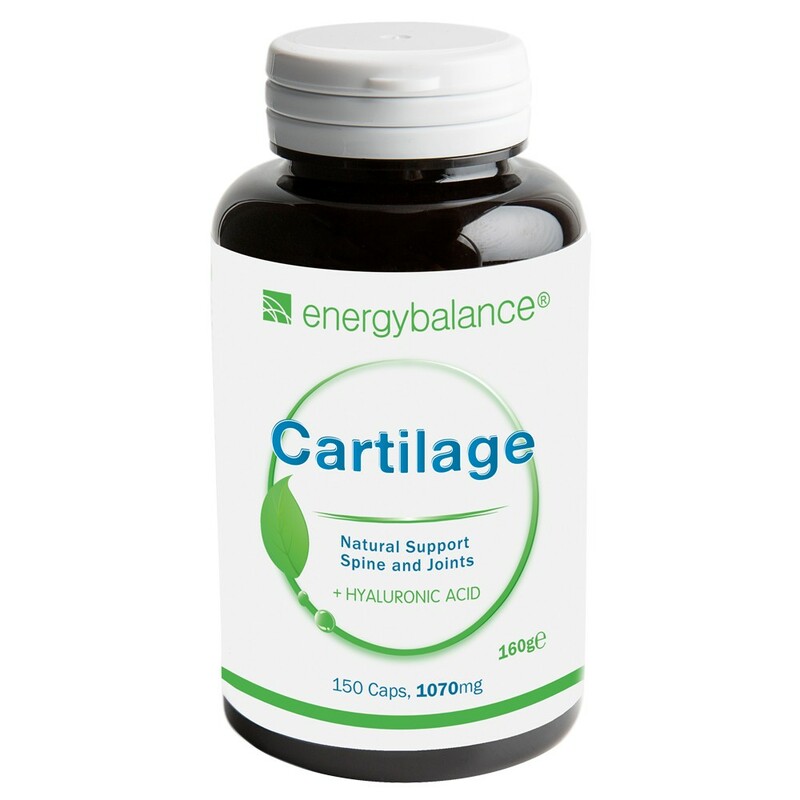 Cartilage by EnergyBalance® is a nutritional supplement specifically formulated for cartilage and connective tissue (back-joints and joints). The capsules contain chondroitin sulfate, glucosamine sulphate, hyaluronic acid and collagen in well balanced proportions and in the right combination with MSM methylsulfonylmethane). MSM (as a bioactive sulphide) is a valid help where the presence of cartilage is crucial. Content: 150 GelCaps, each 1070mg Cartilage. Glucosamine is an amino sugar naturally occurring in the human body. It is a component of connective tissue, cartilage and joint fluid. Chondroitin sulfate is a component of the cartilage, responsible for its elasticity and serves as a shock absorber for the joints. Dimethylsulfone MSM is an organic sulfur compound, a kind of biologically active sulfur. Collagen is responsible for the formation of "Type II" joint-cartilage. Help and possible prevention with food supplements? Joints' wear (arthrosis) is one of the most common signs of age. The loss of elasticity in the joints due to the progressive lack of cartilage at knee level, hips, lumbar area, hands and fingers; it is often associated with pain. According to the statistics reported (available online), osteoarthritis is one of the most common causes of painful bone disorders: affects about 10% of the adult population and 50% of people over 60 years old. Once taken, the large collagen molecules of our organism have to be split into peptides with a deeper molecular weight by means of an elaborate enzymatic process so that they can use our body at all. This is why cartilage contains short-chain collagen molecules. The large collagen molecules were cleaved by means of an enzymatic hydrolysis process into peptides with small molecular weight (long-chain molecules broken down into short-chain molecules) in order to improve their bioavailability, to be absorbed by the body and thus to have their effect. By this method the body can absorb more than 90% of this short-chain collagen. See the product label, take without chewing. Warning, contains chondroitin sulfate*: not suitable for pregnant and lactating women, children, young people and people taking anticoagulants. Glucosamine sulfate, chondroitin sulfate*, MSM (methylsulfonymethane), hydrolyzed type II collagen, hyaluronic acid, rice powder, magnesium stearate vegetable, gelatin (caps). *Allergenic info: contains shellfish (crab, shrimp, lobster, crayfish). 160g = 1070mg x 150 GelCaps of Cartilage.